A regional planning group last Tuesday presented to city officials its 20-year, eight-phase plan for improving bicycle and pedestrian transportation in Waterloo. The “Explore Waterloo” project for alternative transportation was developed by Heartlands Conservancy through a federal planning grant administered by the Illinois Department of Transportation. The goal, according to Megan Riechmann, a community and environmental planner for Heartlands Conservancy, is to transform Waterloo into a more bicycle and pedestrian friendly community than it already is through an integrated biking and walking trail system that will increase recreational opportunities and provide safe routes to various destinations in town. Two upcoming projects — a four mile long, 10 foot wide, shared use path along Route 3 from North Market to Vandebrook Drive, and a one mile path from Route 156 south to Lakeview Park — are already in the works and have been incorporated into this plan. The Route 3 path is part of lane additions and other IDOT road improvements slated to begin later this year; funding for the Lakeview Drive path came in the form of a grant. These two future paths, expected to be completed over the next two years, as well as Waterloo’s involvement in the Safe Routes to School program, raised awareness for such a citywide plan. In the plan is survey of residents and visitors, compiled last year. Most respondents, 84 percent, believe the city should consider non-motorized transport a priority. With regard to walking, 36 percent rated current walking conditions as “poor” in Waterloo, and 89 percent said they would walk more if sidewalks, trails and street crossings were improved. As for biking, 66 percent rated current bicycling conditions as “poor” in Waterloo, and 80 percent indicated they would take more trips by bicycle if there were more routes, lanes and safer street crossings. Top areas listed as “need improvement” in the survey include Lakeview Drive, Market Street and Route 3. The plan also includes an eight-phase project to improve these conditions over 20 years at an estimated cost of $8.8 million. This gives the city a blueprint to work with when applying for various grants, Riechmann said. The phases were chosen in a certain order for this plan based on survey responses, project expense, and construction efficiency. Phase one is a proposed pedestrian path along Market Street at an estimated cost of $1.5 million. Phase two would be sidewalk and shoulder improvements along Lakeview Drive at a cost of around $1.6 million. Phase three includes a path along Route 3 on the north end of town to Country Club Lane and HH Road, connecting to an existing shared use path on Rogers Street. Phase four proposes walking paths, trails and sidewalks linking Rogers Street to Fourth Street, Park Street and Route 156. Phases five through eight include additional sidewalk and trail improvements throughout the city, further linking bicycle and pedestrian possibilities. “It is our hope the city council will adopt the plan as an amendment to the city’s comprehensive plan,” Riechmann said. “This gives Explore Waterloo the ‘teeth’ it needs to be competitive with funding sources. Once the plan is adopted, Riechmann said it is her hope the city will begin to look toward implementation, whether through coordination with future roadway projects or new initiatives via grant applications. Mayor Tom Smith said the council will be reviewing the 48-page plan over the coming weeks. In other action from recent council meetings, aldermen on Feb. 4 approved a Fraternal Order of Police contract for its officers that expires in December 2014. 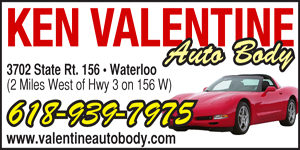 Also on Feb. 4, the council re-appointed Allan Mueller to the city’s zoning board of appeals for a five-year term. On Feb. 19, the council learned that the city’s new website was up and running after more than 40 months under construction. 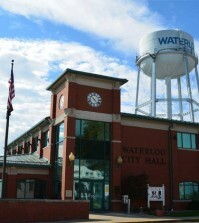 The new site, www.waterloo.il.us, is easier for residents to navigate and find valuable information, officials said. On Monday night, city building inspector Russ Row said he was told the new Gordo’s Margaritas Mexican restaurant in the former Dairy Queen should be open sometime next week.